Designs by Lisa Somerville: Ribbit - He's Back! I dusted off my neglected Frog Pond stamp from Lasting Impressions with Panache and used the Reinker Watercolor Technique from the February Technique Junkie Newsletter to create my background. This technique is perfect for adding backgrounds to line art images. I did find that the Reinker spread nicer when the Watercolor Paper was misted prior to adding the Reinkers; this technique also works wonderfully on Matte Coated card stock. Speaking of colorful backgrounds, I can't wait to ink up my new Gelli Arts Plate, it will be perfect for creating similar colorful backgrounds! I packed it in my bag (along with a number of things) for my creative day with Sue, hopefully I'll get more than just one project done during our visit! Somehow I felt we would see a comeback with him with this technique! ;-) Looks wonderful. I have that stamp!!! thanks for reminding me. guess it's time for me to dust it off and play, too. Just loving your froggie and he looks stunning with that background! Speaking of, I can't wait to see what you do with those plates! I love making my own backgrounds, so this might be right up my alley! So pretty Lisa! What a great result using that technique! 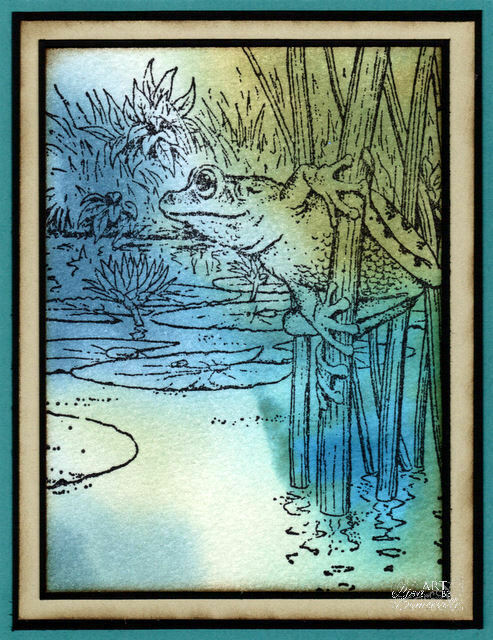 this background looks great with the frog image.